The reviewer borrowed a copy of the book from her local library. 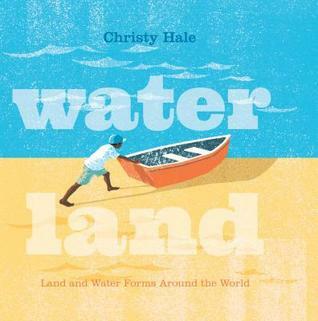 Illustrator and author, Christy Hale, has created a masterpiece in her latest nonfiction picture book, Water Land. The concept book introduces readers of all ages to important geography terms such as bay, gulf, peninsula, and archipelago. The genius of the book is in the die-cuts that illustrate a water form on one page and then a land form on the next page. The illustrations, created from "printed textures and digital layering" depict ships in a strait, sunbathers at the bay, and birds flying over the gulf. A fold-out near the back of the book introduces readers to continents and ocean while also including terms from earlier pages. The bright yellow continents stand out when contrasted against the blue ocean. Hale also created a two-page spread that illustrates the ten major land forms and water forms for comparing and contrasting. Don't be fooled into thinking this picture book is only for the K-2 crowd. It should be shared with older readers as well, especially in social studies classes. I wouldn't be surprised if Water Land receives an honor from the Sibert committee in January. The Sibert Medal covers ages 0-14, so Water Land would be well within the terms and criteria. Visit the publisher's site to view pages from the book. A teacher's guide is also available. I keep hearing about this book. Have to have our library order it--it sounds great!